Welcome to the Safelite complaints department brought to you by HissingKitty. Experienced poor customer service? We make it easy to file a formal complaint against Safelite online. Simply use our free form and your feedback will be instantly forwarded for review. Need to contact the Safelite corporate office? We have the mailing address, phone number, and email address listed below. My insurance company is USAA. They told me I had to call safelight for a windshield replacement. I called safelight and was transferred three times. Then when I reached the USAA claims service the lady was EXTREMELY rude. She told me...How can you have a claim number when you haven't even called us yet? She continued to be condescending and rude until I finally hung up and called USAA to say I will never deal with them again!!! Unbelievable!!! The time/date of the call was 4/12/19 a little after 9:10am CST. PLEASE listen to the recording of that call Safelight Corporate. It was with the USAA department. I had an appointment window between noon and 5pm today. I was told the technician would give me a call around noon with a more specific time. I did not get a call so I ended up calling at 4:40pm. I was told the technician's work phone was not working so they were going to reach out to the technician's manager so they could call the technician on her personal cell phone. I ended up getting a call from the technician on her personal phone about ten minutes later saying she was just made aware of my order a few minutes ago and that it would take her about 40 minutes to get to me. (Mind you that would put her at my house around 5:30. I've been waiting around all day on my only day off to get things done with no communication from anybody at Safelite. I'm very disappointed with Satellite and their communication skills. Referral # 929655 - (January 2018) Broken Front Windshield broken. Filed Claim. Windshield replaced at residence. Windshield replacement not installed properly. Destroyed NY state annual inspection sticker (3 previous vehicles stickers not destroyed) . Argumentative staff and unwilling to make things right! Never again will I use this company!!!! Tried to call local service 2 times and was put on hold 1st time 4 minutes and 2nd time over 5 minutes. That what I call lousy customer service and won't be calling back on your company. 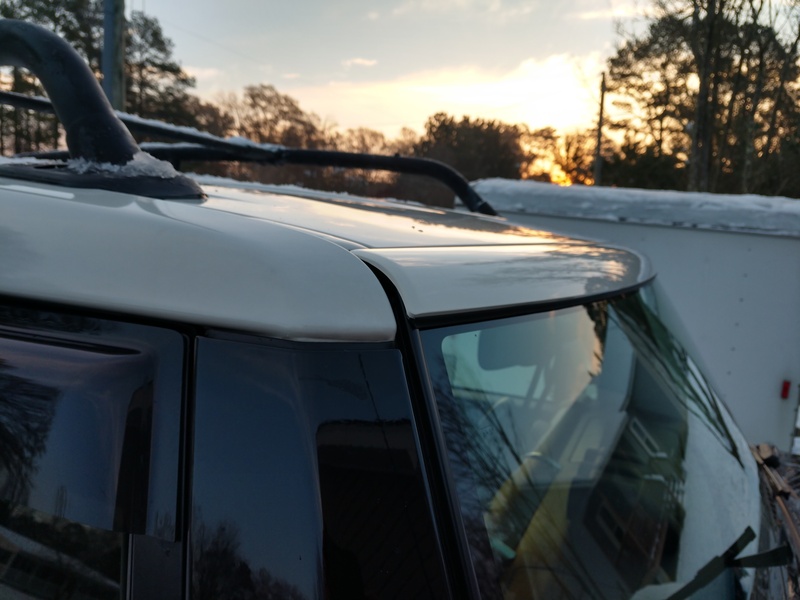 I took my 2012 Toyota FJ cruiser to Safelite in Williamsburg, Va on December 4th to have a new windshield installed. I had to have this done in their shop because the top molding has to be replaced with the windshield. I was there approximately 2 hours, and part of the time was to do a walk around the vehicle to inspect for any kind of damage. The technician noted that the rubber seal on the bottom of the radio antenna was a little dry rotted. I work rotating shift and was starting midnight shift that night, so when the windshield was done I paid for it and left to go and get some sleep. I don't drive this vehicle as a daily driver, it has only 42,000 miles on it and I purchased it new. After working 9 straight midnight shifts, and in the meantime we had 6" of snow I noticed that the trim they installed was crooked, scratched, and not lined up at all. I started checking the entire area around the windshield and noticed scratches on both sides of the roof. I took the vehicle back and told the manager I needed him to come and look at it. Meanwhile a technician if that is what you would call him spoke up and said the molding wasn't supposed to line up with the roof line. After informing him that he didn't have a clue what he was talking about the manager took over. I told him that this was my 2nd FJ cruiser and I had a windshield replaced in my other one with no problems at all ( not by Safelite though). He scheduled me to come in today December 15th to replace the windshield, and was going to schedule a vendor to come and repair the scratches. I showed up today and I'm sitting there it's 9 and nothing has been done to my vehicle, still sitting where I parked it. Then a guy showed up and the woman behind the counter talked to him, then she came to get me and said this was the guy who was going to be fixing the scratches. After he finishes, and he did a great job, the woman comes out to tell me that they won't be able to fix the windshield today and she would call me when they got the new molding in. So the next trip to maybe get my windshield fixed will be the 4th trip, approximately 50 miles round-trip. Needless to say this will be the last time I'll ever deal with this company. I'm going to attach the pictures of the scratches, and the shoddy work on the molding. And on top of the whole situation, not even an apology. Sad !! I scheduled appointment for Wednesday 11/21/18 and the Safelite guy called At 11:07 to tell me he would be there after 5:00 pm to replace windshield knowing I don’t have a garage or lighted place to put car. So he call me again at 545 pm to ask me if I had a lighted place to put car and unless he doesn’t know we have to put that on the report to get window fixed???? So he apologized and asked me what would be a good day to come back and I said anytime Friday and he said ok. Then he called me back at 552 and said that wasn’t going to work they were booked and ask me for another day and I didn’t have another day because my daughter was going back to college with car! I feel I should have been 1st on the Friday list seeing he put me off, very upset and won’t ever use Safelite again!!!!! Fixed my windshield, damaged by truck by accident, now they disappeared. I work in the insurance industry, dont recommend them. I had a glass replaced by Safelite in Concord ,N.C. and my windshield wipers weren't replaced properly. I was in the middle of a rainstorm, wiper flew off and assembly was properly tightened . I would never use their service again. I am have a disability. The lady Cynthia at the Satellite location at 20th Drive was not welcome. She was very rude to me. She was not willing to assist at first. She so rude to me for no reason. I had an appointment. She said it was not in there system. I was on time. The mess up on my appointment. Be careful they are not nice to people with disability. The technician who contacted me the day of my appointment spoke to me in a verbally aggressive and rude manner. I tried to salvage the conversation twice and I finally said this isn’t working and I need to speak with someone else. He then hung up on me. When my husband called to file a complaint, he was asked if he wanted to complain or reschedule. I will never ever financially support a company that treats its consumers with such poor customer service. We are in the process of filing as many complaints as possible because the issue is clearly systemic and customer service is not a priority. Regarding Safelite/Richardson Auto Glass, Decatur, TX. These people are a scam. The owner will lie to you and slow walk you. They damaged a vehicle I had them work on and they first refused to acknowledge that I was dissatisfied but then tried to lay the blame on me and FINALLY agreed to send someone out to assess and repair the problem. Well, well. The day of the return appointment a man called, said he was finishing a job near me and would be over shortly. Needless to say, and in accord with the shoddy service this place purveys, the repairman never appeared. To add insult to injury, they never called me back after this terribly irresponsible action to this date and my vehicle is still damaged. I am stopping the credit card payment to these people and am speaking with an attorney about small claims or the possibility of litigation against the parent company Safelite Auto Glass . They are also being listed on rip-off reports and the BBB. I will NEVER do business with this company again. From me to you BEWARE!!!! This is a scam company that has a rude and lying owner. DO NOT have your windshield repaired by this jerk. I have had 2 appointments with safelite on the same claim and both appointments were cancelled at last minute on a Saturday for the same reason. Could not find a claim number. Me and the Insurance have given ya'll the claim number three times. I waited 1 month in between each appointment and they cancel again last minute BOTH TIMES. Why the hell arent ya'll accepting the number given? and if theres a problem, it should have solved before the day of service call!!! The Insurance Berkshire has also contacted you. This windshield has a crack all the way across now with another forming vertically. If it breaks and causes an accident, We will certainly be contacting an Attorney to go after you and the Insurance for not addressing this problem. Contacted my Insurance company to replace damaged window which I was provided Safelite as the company which was going to replace my windshield Set up appointment which they came out to my house at 25282 Eldorado Hills, Ca,91302 with the wrong Windshield I was advised it was going to be a few more days to get the right windshield which was putting my vehicle from driving on road again for few more days, while waiting the time they did arrive but with the wrong windshield again and I was told it would be even more days. You can see my frustration in where I could drive my car which I had to get around in for over a week. Someone needs to know that the person in charge of my order needs to be reprimanded. Please respond at your earliest convenience. A driver called my job said he had to come here to replace a windshield on a RV van. I am the receptionist, he was very rude and unclear at first on what the nature of his call was about and his message was all scrambled. As I tried to get out of him what he was trying to say he even got louder screaming at me and hung up on me. He was very rude and unprofessional. Several hours later 2 Safelite trucks pulled in sat a few minutes. At that point I knew who the company was because before that due to his demeanor of his conversation I could not even make it out. The repaired the van and left. I wish the punk came into my job so I could have confronted him on his behavior and how it reflected the company. I own a 2001 Ford F250. Four+ years ago I had Safelite replace a cracked windshield at my home in Hopkins MN. Recently I had Safelite come out to my home now in Emily MN to replace the previously Satellite replaced windshield that had a crack going down the middle. While the installer was removing the windshield, I happened to mention that I was experiencing electrical problems and batteries draining but no one could locate the problem. After removing the windshield the installer noticed a rust hole about the size of a pea in the lower driver's side corner. He attempted to cover it over with the adhesive but called his office to provide guidance. His supervisor told him to not only not install the new windshield but refused to allow the old windshield to be placed. So here I am stuck with a vehicle with no windshield. Apparently there was no problem when the previous windshield was replaced by the Satellite installer but somehow after that installation this situation happened. Terrible way to leave a customer who has relied on your services! 4990 suite 900 hamburg ny i purchased running boards for my truck that i bought from a local dealer made of composite material. I watched for over an hour and a half 2 giys walk up and down the running boards and watching them bend under their feet. I went outside to watch better and i asked one of the guys if he could feel them bending and he said no. I asked him instead of using my truck as a ladder dont they use step stool or ladders and he said no. So if my running boards were to crack and get damaged and i didnt see or watch them bend they would have told me it wasnt them. YOU HAVE TO BE KIDDING! I have used othe glass companies in the past and your vehicle was never the lasdwr to brace a 200+ man as a ladder. I am NOT suprised at the low rating . I WILL NOT EVER RECOMMEND OR USE SAFELITE AGAIN! Extremely dissatisfied customer . Not only with the running boards i purchased which was not them of course but on the care and lack of care used to put in the windshield ,using my car as the ladder and step stool . had an appointment Monday 6/11/2018, wrong windshield. New appointment fo Friday 6/15/2018. Installer called said he would be here between 1:00 and 3:00 pm. No show. Called office at about3:40 office couldn't reach him. called 5:13 office closed. So what am I suppose to do now? Give them a third chance? very POOR CUSTOMER SURVICE. I own a 2017 Kia Sportage with a broken windshield from 09/16/2016. A rock from a passing car cracked it and has sense spread across the windshield. Safelite auto glass says they are on back order. Kia says they will look into it, where are these windshields? Why are there no replacements in the U.S.? I ordered a car with Safelite because I heard it was better quality and would not break.